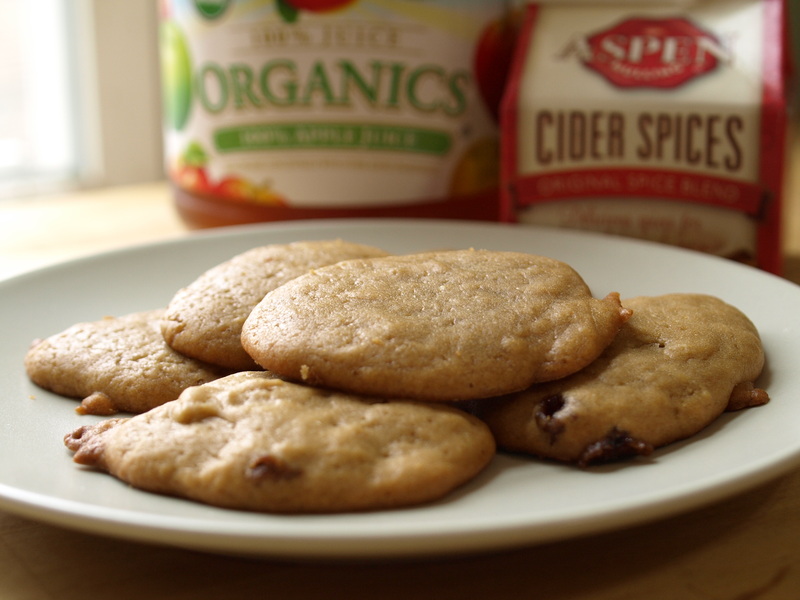 Nick recently got an e-mail from VegNews featuring a Chocolate Sugar Cookie recipe, so we decided to try them. 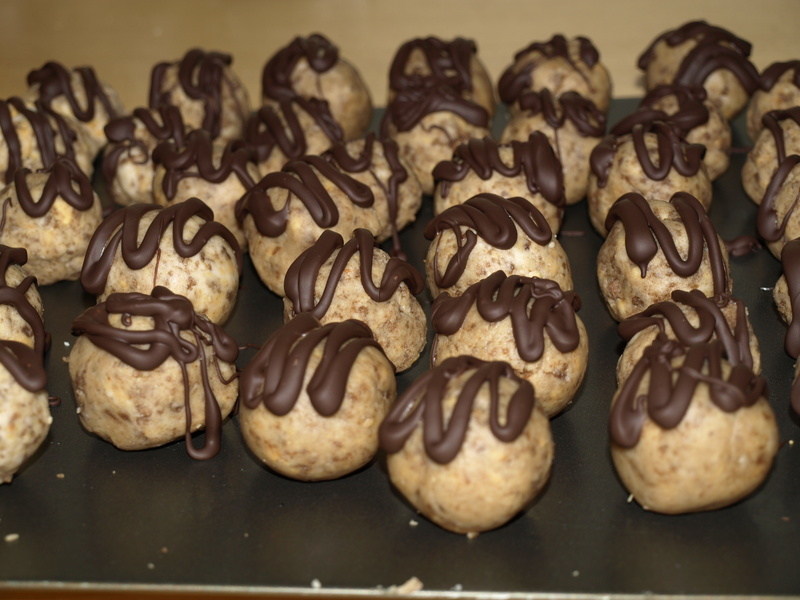 They weren’t as chocolaty as we had hoped, but I also didn’t add anything to them. I’m sure with a little melted chocolate drizzled over them, they’d be fantastic, but plain they’re a subtle not too sweet treat! 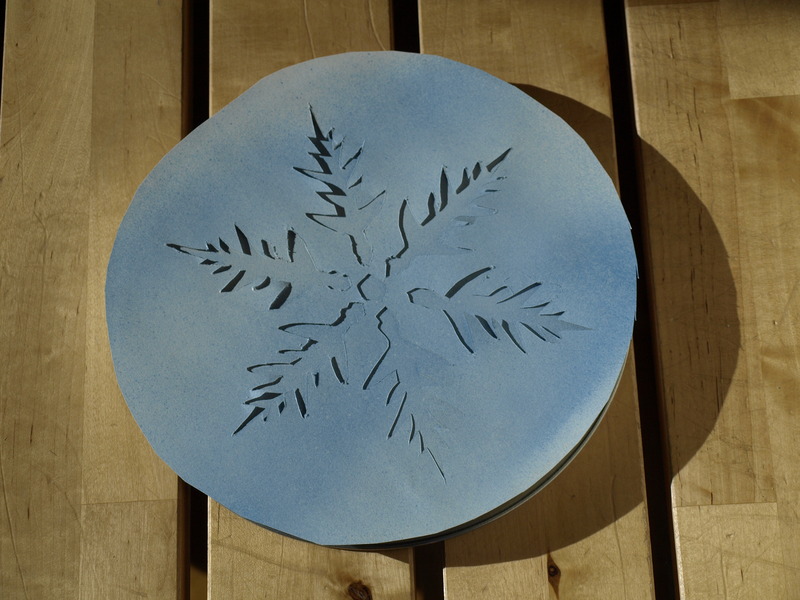 Rub the lid of the tin in a circular motion with the sandpaper until the whole surface is scratched up. Wipe off dust with a damp cloth and set aside. This will help the paint stick. 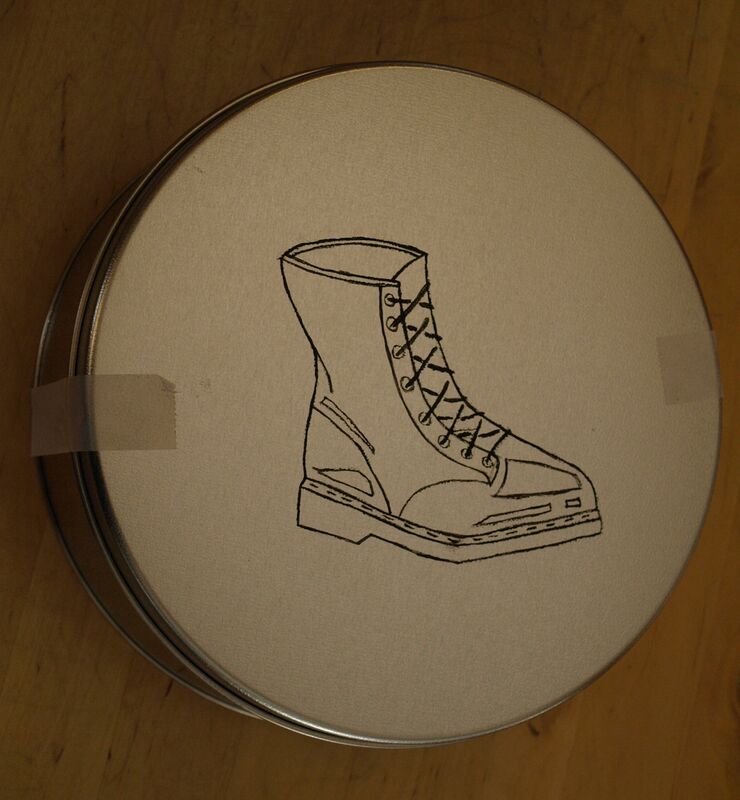 Find a stencil of what you’d like to put on your tin. 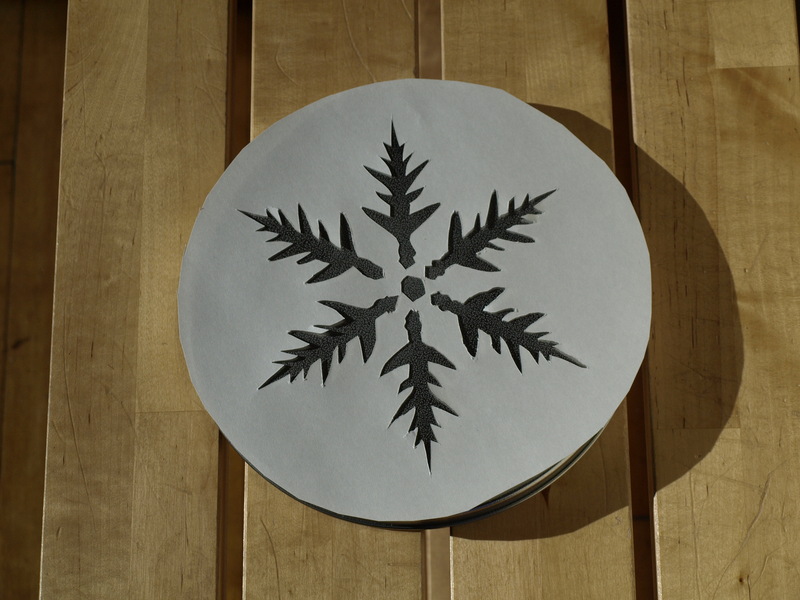 I used a snowflake stencil from here. Print the stencil out and copy it onto your cardstock. Once you’ve copied it, place the cardstock on the cardboard so you don’t damage your work surface while cutting. Use the pen/utility knife to cut out the inside of the design. Center the design on your lid and use tape to adhere the stencil to the lid. Make sure to leave a little bit of paper hanging off around the edges of your lid so you don’t accidentally paint the sides of the lid. Shake the spray paint colors of your choice according to the directions on the bottle. I spray painted these outside in 20 F weather. If you don’t want to spray paint inside of your house it is possible to do so when it’s cold out. You just need to be quick. I took the lids off of the cans and shook them while I was still inside. When they were ready to go I took the lid outside and put on one coat of each color. I used white first and then blue, though Nick pointed out that if you use the darker color first you it will create more contrast between the lid and the design. As soon as I was done applying the paint I brought everything back inside and placed the lid in a sunny spot to dry. I let it dry for about twenty minutes before I went outside and applied a second coat of both colors. If you’re not sure if it’s dry touch the paper stencil with your finger. If it’s still sticky then wait a little while longer before applying another coat. 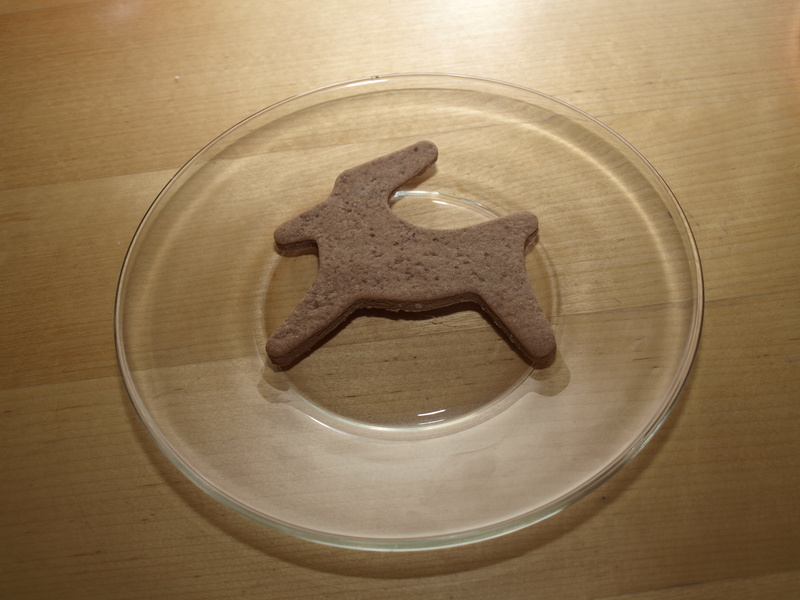 Once your tin is dry you can wash it using a cloth and soapy water before you put your cookies in and give it away. 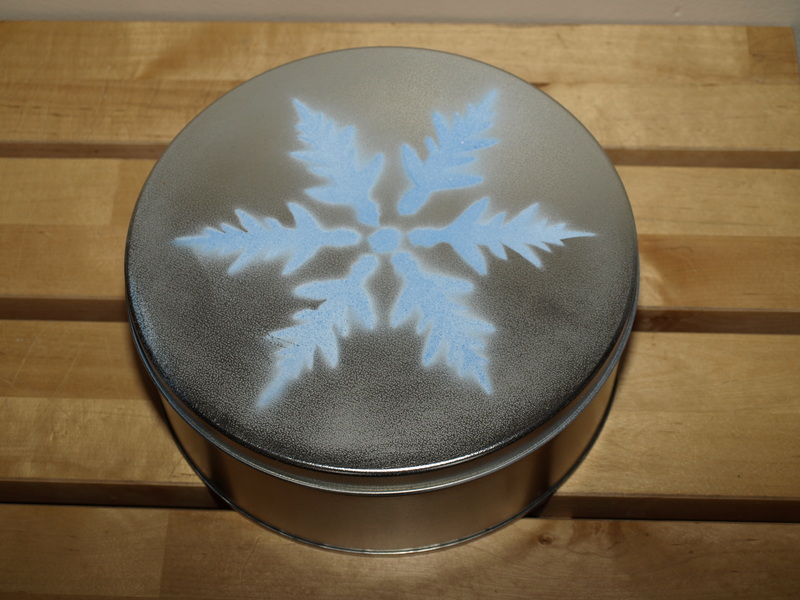 Did any of you make any cool cookie tins this holiday season? 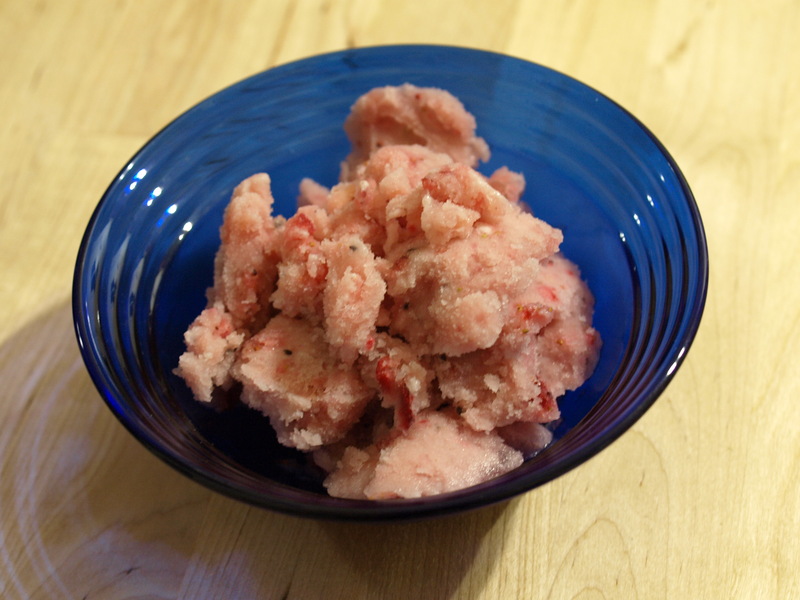 This recipe was originally for rhubarb bars, but unfortunately I was unable to find frozen rhubarb at any of my local grocery stores, so I improvised. 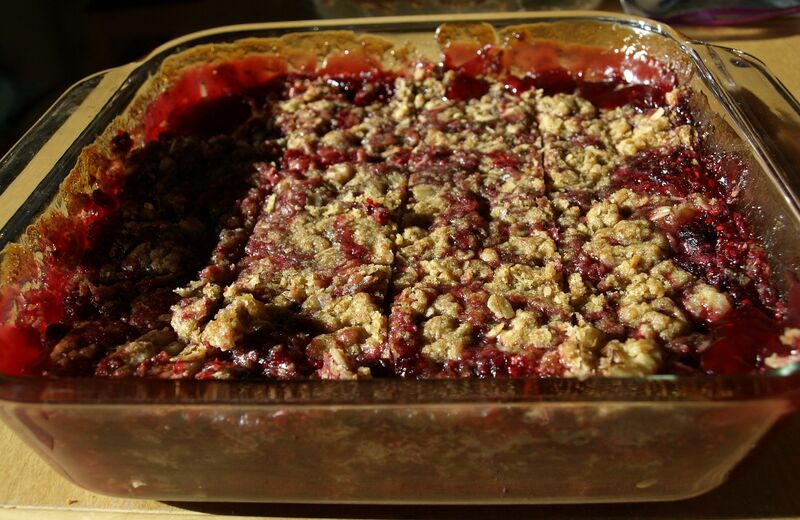 You can try substituting other fruits for the raspberries, so you can have a bar for every season. Place the filling ingredients in a large saucepan, mix and simmer until thick. 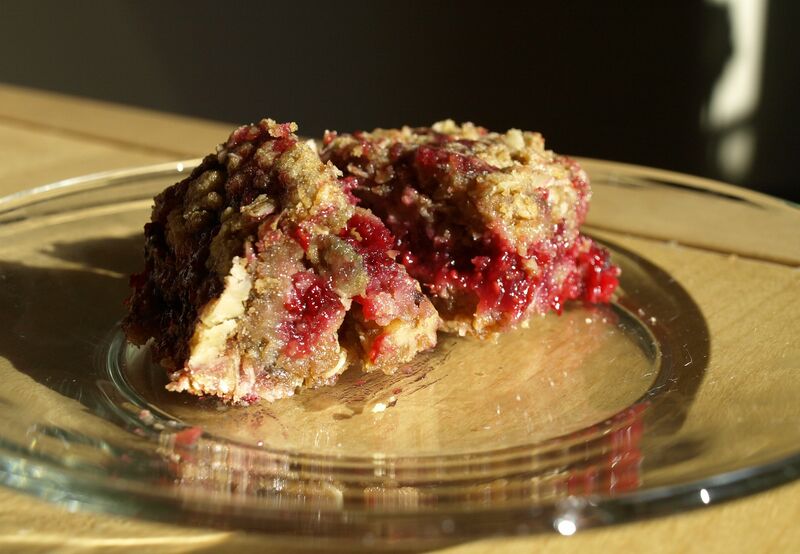 While your filling is cooking, blend margarine and brown sugar in a medium mixing bowl with a fork. Sift baking soda into flour and add to margarine/brown sugar mix. 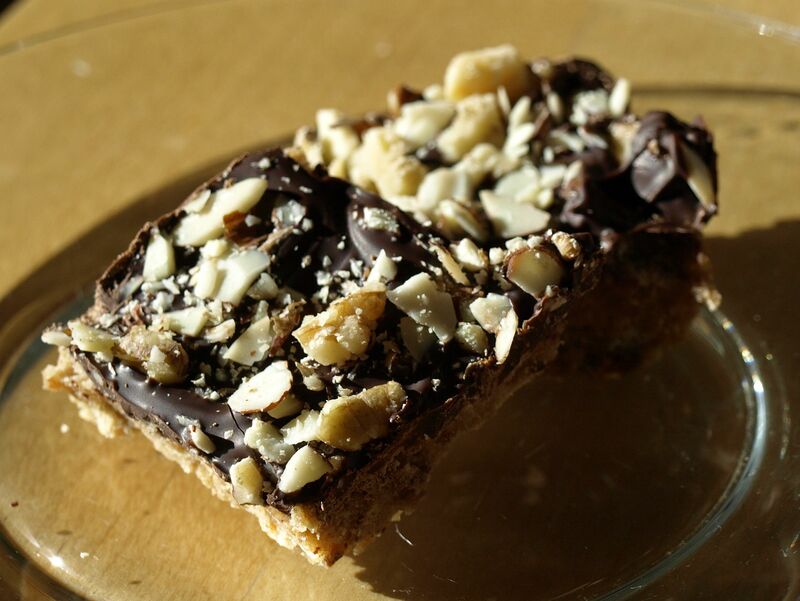 Mix in oatmeal and nuts until dough is crumbly. Pat 3/4 of the mixture into the bottom of your pan. Pour your filling mix on top once it has thickened. Sprinkle the remaining dough on top of filling. Bake at 375 F for 35-40 minutes. Place on a cooling rack. 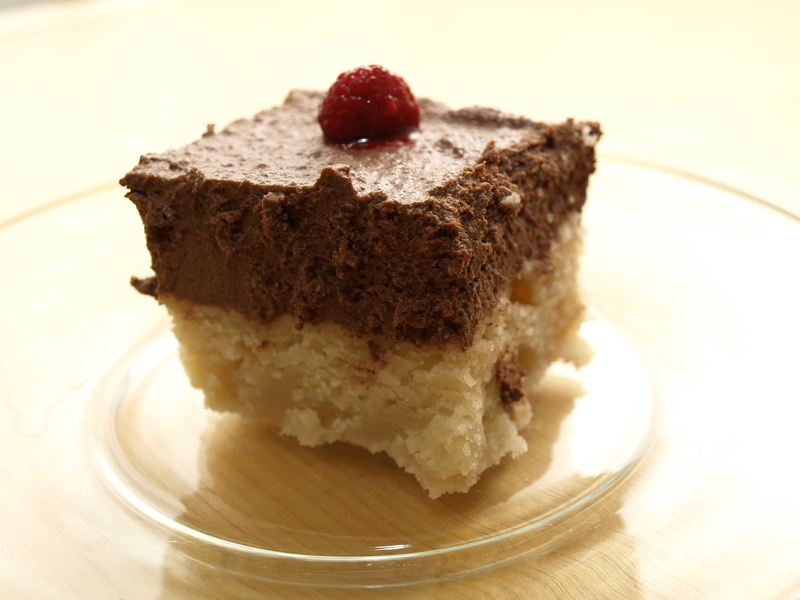 Refrigerate overnight or for at least 8 hours so it solidifies, then cut into cubes and serve. These go great with a bit of vanilla ice cream. The boot was drawn on with a pen knife and then the lines were inked in with a thin brush and a few coats of black paint. I think it looks pretty cool and Ralph seemed pleased!